'Lolla' Winner of the Weekend . 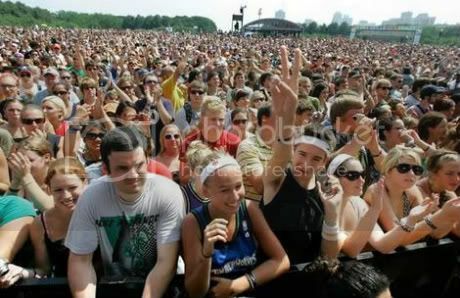 . .
Lollapalooza crowd photo via theage.com. This feel-good story of the moment comes on the heels of a Bon Appetit writer ranting against the communal dining trend. Some people dining communal style at Girl & The Goat over the weekend got acquainted enough with their generous tablemates that they not only got their dinner tab picked up, but were given VIP passes to Lollapalooza for Sunday night. "I'm a believer in communal tables: tonight at g&g our fellow diners picked up our tab & gave us 'Lolla' VIP passes." Lesson learned here: Get to know thy neighbor!